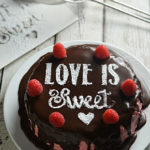 Nothing says “love” like a sweet treat from the heart. 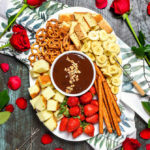 Especially if that treat happens to be dense, rich, creamy dark chocolate fudge blanketed in a layer of strawberry fudge with swirls of preserves. I’m drooling. 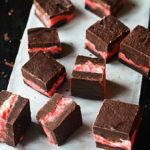 This Chocolate-Covered Strawberry Fudge requires only 5 ingredients and is perfect for somewhat last-minute Valentine’s Day gifts! Speaking of which, if I’m being honest, I still have no idea what to get James. Tell me I’m not the only one who has completely avoided planning for the holiday, please. Also in the spirit of being honest, I’ve got to admit that I am absolutely kicking myself today because I went to upload photos of this beautiful fudge being made, and I realized that I overwrote them last night. Windows even has a dialogue box that pops up and says “Are you ABSOLUTELY SURE that you want to make this terrible mistake right now?” (or something along those lines) and I mindlessly clicked yes. I clicked yes, and overwrote 90% of my fudge pictures with pot pie. Sigh. At least I’ve still got two to share with you. Two photos, but no fudge. That’s all long gone, my friends. What I can also honestly tell you is that this fudge was fantastic. James and I could not stop picking at, and after dozens of “one more piece” promises were broken, we decided to bring the remainder to our friend Kait’s house and pass it off to her. She told me last night that she ate it every day for a week and still was craving it after there was none left. That’s a seal of approval in my book. 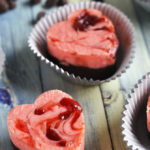 Make these for someone you care this Valentine’s Day and watch them light up as they take a bite! Line an 8 x 8″ baking dish with parchment paper and spray with nonstick spray or rub lightly with butter. In a large, microwave safe bowl, combine 14 oz of sweetened condensed milk and 12 oz dark chocolate chips. Cover the top with a paper plate and microwave for 2 minutes, stir, and microwave for an additional minute if necessary to completely melt the chocolate chips. Pour the fudge mixture into the baking dish and spread evenly with a spoon or spatula. Set aside. In another large, microwave safe bowl, combine 14 oz of sweetened condensed milk and 12 oz white chocolate chips. Cover the top with a paper plate and microwave for 2 minutes, stir, and microwave for an additional minute. Stir again. White chocolate is sometimes difficult to melt, but the more you stir, the more melting you will get. If necessary, microwave for another 30 seconds, but be sure not to burn the white chocolate. 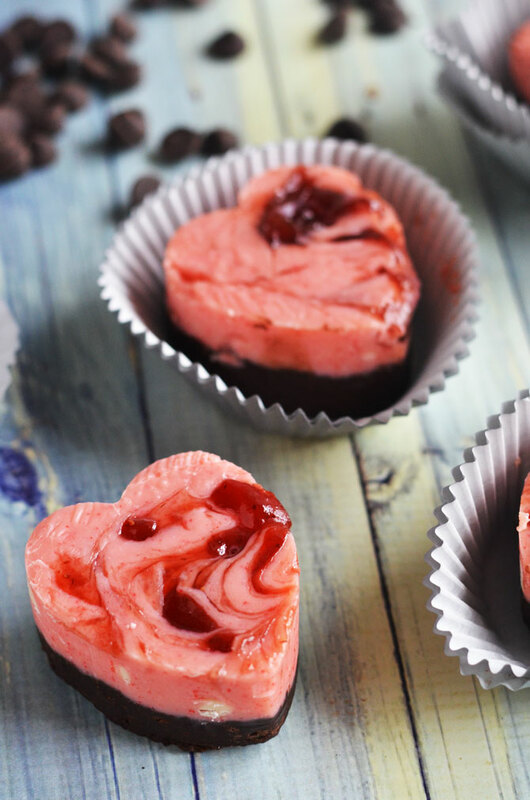 Let cool slightly and mix in the 2 teaspoons of strawberry jello powder. Pour the strawberry fudge mixture on top of the chocolate fudge mixture. Using a small spoon, dot bits of strawberry preserves on top. Using a toothpick, swirl the preserves into the fudge until wispy. Cover and refrigerate for at least 2 hours, to set. Remove the fudge from the pan by pulling out the parchment paper lining. 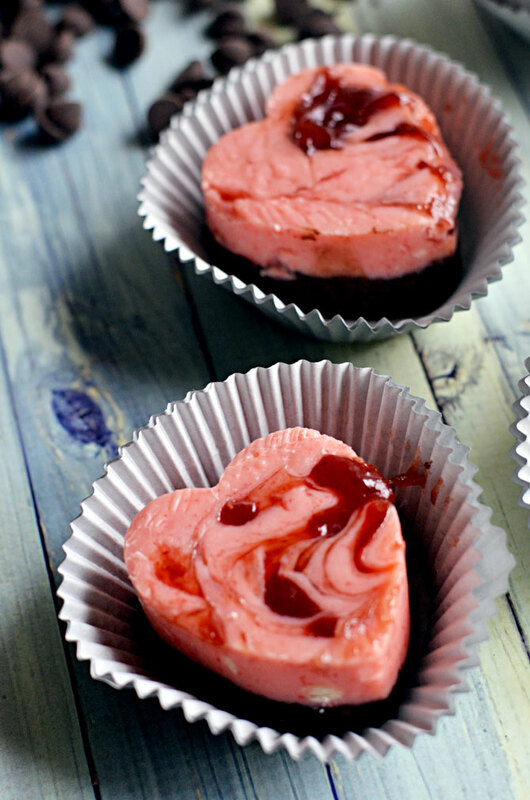 Cut the fudge into cubes or use a heart-shaped cookie cutter, and serve! This is so perfect for the grand girls to make tomorrow with Nannie. Thank you for the simplicity of it. Does it cut through fairly easily? I’m sorry that I didn’t see this earlier, Elizabeth! 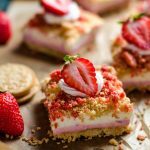 It does cut through fairly easily (and requires less effort to cut at room temperature than when it’s very cold). I hope that you and your granddaughters enjoyed the recipe if you did wind up giving it a go together!